Home » Blog archive » Which type of volunteer work can you do? Which type of volunteer work is available? The type of volunteer work depends of course on your interests. 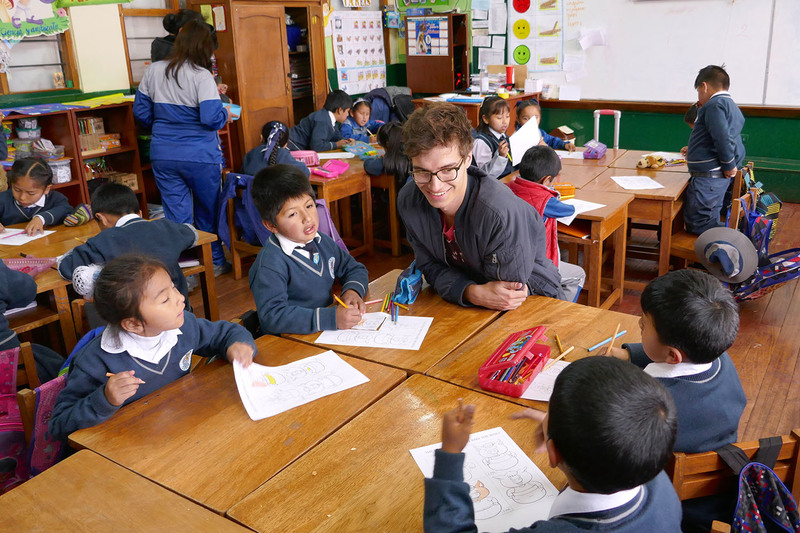 In Peru there is mainly demand for volunteers in these four sections: after-school projects for children from deprived urban area. Teaching English in public school. Assist in a local kindergarten or help out in a dog shelter and their campaigns. Some projects just outside the city center organize after-school activities for children. After the morning classes the children are being exposed to the bad influences of the street or possibly their unstable home situation. In the after-school project they learn essential norms and values through games and activities. These projects run for 2 or 3 hours per day. The core activities are helping with homework, Teaching English and Sport & Games. The level of English in public schools is very low. Schools are understaffed. And classes and level differences are big. The teacher salaries are low, as a result of which good English speaking teachers often find better paid jobs. As a volunteer you will not stand alone in front of the class. You work together with a local teacher, or with another volunteer. You can help with the correct pronunciation. Or bring in your own ideas to teach the children the scheduled subjects. With 2 teachers there is better assistance and control if the students are copying the English in a correct way. Another type of volunteer work in education is the kindergarten project. Playing together, sit still in a classroom and learning the alphabet. And of course, drawing, singing songs and having fun! Assist the teacher during all these activities. Once again level differences will be present. And the kindergarten is the place for extra attention for children who need that. But having fun, and giving children a positive feeling with education is the main ingredient. The dog shelter is a fabulous project for animal lovers. The setting is not one of caged dogs that need to be washed and walked on a leash. The dogs in a Peruvian dog shelter run around free on the courtyard. Most of the work will be done outside of the shelter. On the street there are a lot of dogs that urgently need help. Together you will go on rescue expeditions or organize campaigns to make people aware of how to treat their dog. The tasks are very varied and even in a short period you can see the fruits of your efforts. A combination between these projects is very well possible. Together we compose a volunteer program that fits you best. Since volunteer work is free of costs, there are no extra fees for a project combination. The costs are for the accommodation and the staff assistance. And possibly for the Spanish language course. Contact us to discuss your possibilities!